Welcome to the Brushy Creek Neighborhood and Boy Scouts of America Troop 165! Our Troop meets every Tuesday evening at 7:00pm, at the St. Philip's United Methodist Church. Our location is t 16321 Great Oaks Drive, Round Rock, TX 78681, in the Brushy Creek area of Round Rock, Texas. We invite you to come visit us and share in the scouting experience! Our weekly meetings are held at the St. Philips United Methodist Church, every Tuesday evening, from 7:00 - 8:30 pm. We usually reserve one of these meetings for a PLC (Patrol Leaders Committee) meeting. Our meetings are run by our senior scouts, and elected leaders, with a different program each week. Throughout the year, we we may engage in rock climbing, canoeing, woodworking, archery, rifle shooting, knot tying, first aid training and instruction, orienteering, and much more. And let's not forget "camping trips"!!! Boy Scouting provides a series of surmountable obstacles and steps in overcoming them through the advancement method. The Boy Scout plans his advancement, and progresses at his own pace, as he meets each challenge. The Boy Scout is rewarded for each achievement, which helps him gain self-confidence. The steps in the advancement system help a Boy Scout grow in self-reliance and in the ability to help others. Like many other Boy Scout Troops, we do work on Merit Badges or rank advancement during the Tuesday night meetings. We have skill demonstrations and interesting programs, fun games and competitions, and announcements about our upcoming events! 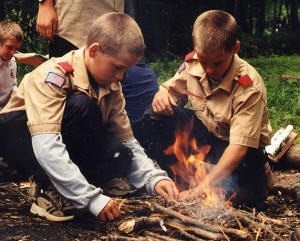 Boy Scouting offers young men many opportunities to learn new skills, have new adventures, and work with lots of individuals (both adults and young leaders) with varieties of skills and talents. As boys gain new outdoor and life skills, they are awarded with a badge of rank, and memories to last a lifetime. These badges they earn help them to move along the trail to the Eagle ranking, a world-wide recognized achievement in the life of the Boy Scout. There are 6 ranks in Boy Scouting. Each rank is more challenging than the one before it. The first three ranks, Tenderfoot, Second Class, and First Class, offer boys a chance to learn some of the basic skills that will be needed to be a better camper, hiker, and citizen. Many scouts earn these awards during the first year of scouting. Parents, be patient. It usually takes a full year for the boy to mature, and to find his place in the Scouting Program. But we all work together, and are there to help him in this process. Scouting is all about helping one another to learn, to grow, and to become self-sufficient, resourceful and prepared for life! The Star and Life rank provide opportunities for the scout to practice what he knows, learn additional leadership skills, and to learn new skills through the merit badge program. As the boys progress through these ranks, they show their dedication, hard work, and leadership skills, and begin to desire to become an Eagle Scout. The Eagle rank is the highest rank possible in the Boy Scouts of America. Receiving this rank says much about the man that the Scout is becoming. Seldom does a boy under 14 or 15 earn the rank of Eagle, though it does happen in our troop. The average age to earn Eagle rank is about 16-17 years old. Our Troop has a strong record of rank advancement, see our Eagles Nest. There are multiple opportunities for scouts to work on advancements, in troop meetings, on monthly outings, and during high adventure activities. ... so that we can make sure that your visit is a memorable one. please contact our Chisholm Trail District.